Ore Crop mod adds the ability to grow different ores in your backyard: diamonds, coal, iron and gold. You can also grow the ore with the help of Plants Trees Ores mod. How to grow the ores? To get the ore seeds, you have to craft them. Next, build a small farm (as for growing simple seeds), you need to till the soil and add water near. Now, just plant your ore seeds and wait until they grow up. And finally, collect seeds, and now you can craft of them even more precious treasures: diamonds, coal, iron and gold. Click on the wrench key, then "Settings" and "ModPE Script". Now click the "Add" button, find the downloaded script (mod) in your device's file system and click on it (OreCrop.modpkg). 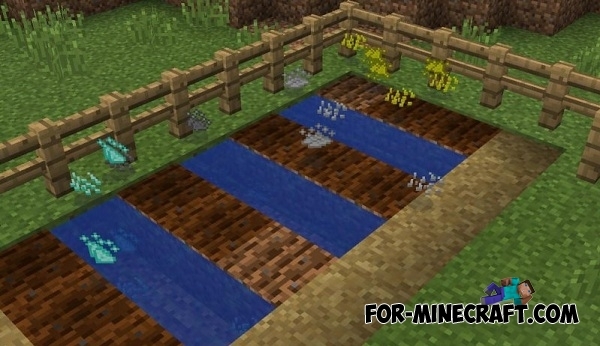 Exp Crop mod for Minecraft PE 0.14.0/0.14.1Exp Crop mod adds a crafting recipe that will allow to create a modified seeds by which you will be able to grow a experience crops.